Facts and information about the History of Clothing and regalia of Native American Indians and their Native American Furs. There were many Furs obtained by the Native Indian tribes who inhabited all the areas across the continent of North America. The Native Indian furs were originally used to make various types of clothing for both practical and decorative reasons. European explorers and traders discovered the rich bounty of the lands during the late 1500's and the lucrative fur trade began. Beaver was of particular interest due to the European fashion of wearing hats made of beaver. When the demand for beaver declined it was replaced by the the massive trade in deerskin. Fur trading between the Indian tribes and European colonists began in the late 1500s and lasted until the late 1800s. During this period the demand for fur was surging in Europe. 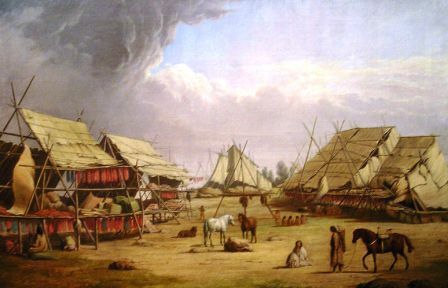 Native American Furs Fact 2: Trading posts were established by the French, English, German, Scandinavian and Russian traders across the North American continent. Native American Furs Fact 4: The Beaver trade fell into decline and was replaced by the trade in Deerskins. Native American Furs Fact 17: Skunk fur was also abundant and described and marketed as "Alaska sable"